When Porsche 911 addict Alex Motola had to settle on a color for his ST-inspired 911 project, he took the easy way out. He simply left the decision to someone else. More specifically, that someone else was his daughter, Kate. He did limit her choices to the early Porsche color palette the factory had used. Despite his best efforts, the palette was quickly discarded by Kate, who simply said “pink.” Spoken like a true 7-year-old girl. Alex’s appreciation for Porsches began when he was a high school student. Growing up east of the San Francisco Bay Area, he recalls a great car culture he and his friends were immersed in. When it came time to buy his first car, Alex jotted down a list of European sports cars he could purchase with the modest $3500 budget he'd managed to scrape together. “At the very bottom—almost as an afterthought—was scribbled 356,” he says. 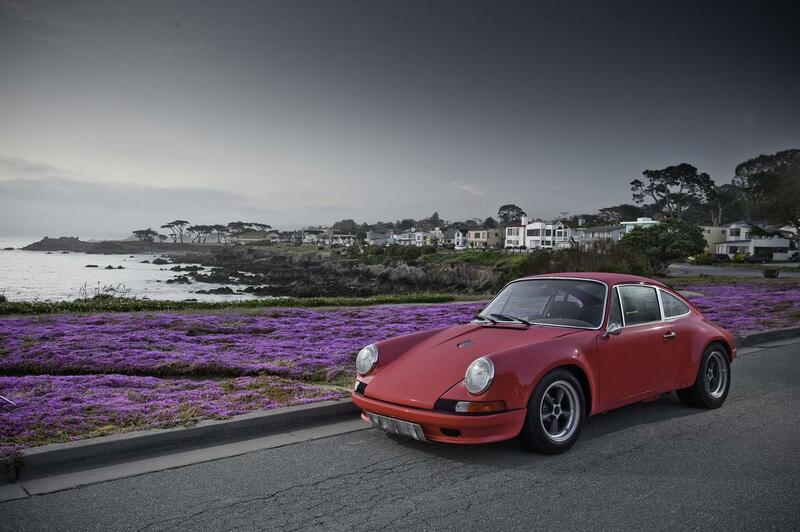 Years later, Alex now suffers from a self-described “911 fetish.” He’s carried on the tradition of 356 ownership with a 356 SC, but he also has a 1971 911T Targa, a 1974 Euro Carrera, a 1967 short-wheelbase 911 race car, a 1971 911T project car and a 2008 GT3—oh, and the pink hotrod pictured here. When he showed up to see it, it wasn’t exactly a pretty sight. The original Albert Blue had been covered with a cheap white paint job at some point, and overall the 911 was in bad shape cosmetically. Perched on the rear end was a whale tail from a later model. “It had disco-tastic, shaggy blue seat covers over the original low-back seats,” he adds. On the upside, Alex had spotted a few rare and valuable parts on it, including the Fuchs wheels: 7R-spec rears, “deep six” fronts and a spare. All of these are like gold to early 911 fanatics. The idea of having the 911 restored to original spec was quickly shelved in favor of an R Gruppe-style approach to the build. What does that mean? R Gruppe is a club for owners of 1973-and-older 911s that have been modified in the spirit of the factory’s competition 911s. With that end in mind, Alex had the 911 shipped out to TRE Motorsports, Inc., in Los Angeles, a 911-centric Porsche shop owned by Dave Bouzaglou. TRE partnered with Axiom Motorsports of Inglewood, California, on the build. The target was a loose approximation of the ST, a race-ready variant offered by the Porsche factory in 1970 and 1971. 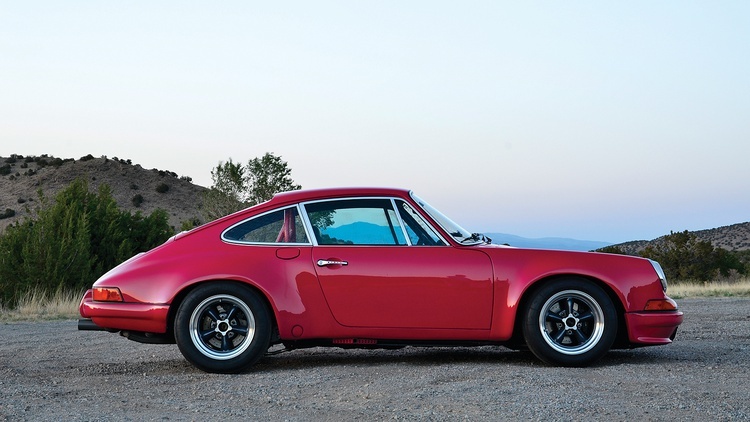 The front and rear fenders were flared to accommodate larger wheels and tires, but unlike the later and much-copied Carrera RS, there was no rear spoiler. So what’s it like to drive Alex Motola’s brightly colored beast? With the sun rapidly dropping toward the horizon, we slid into a TRE-built, vintage-style bucket seat for a quick drive. The interior has been swathed in Alcantara: The suedelike stuff covers the dash, door panels, door tops, seat centers and even the headliner. The suede, deep-dish Momo wheel feels great and also nicely frames the tach, which does without a redline and simply reads to 10,000 rpm. Other less obvious changes include gauges that have been converted to LED, power window switches disguised as manual window cranks, a HomeLink system and a hidden stereo. At idle, the 3.4-liter engine is surprisingly quiet, growling deeply through the muffler. “Just hear it when it comes on cam,” Alex smiles. With around 280 crank horsepower and relatively little weight to lug around, it’s a given that this 911 is quick in a straight line. A deep rumbling at low revs quickly transforms into a wail, then a ripsaw shriek as the tachometer needle climbs. 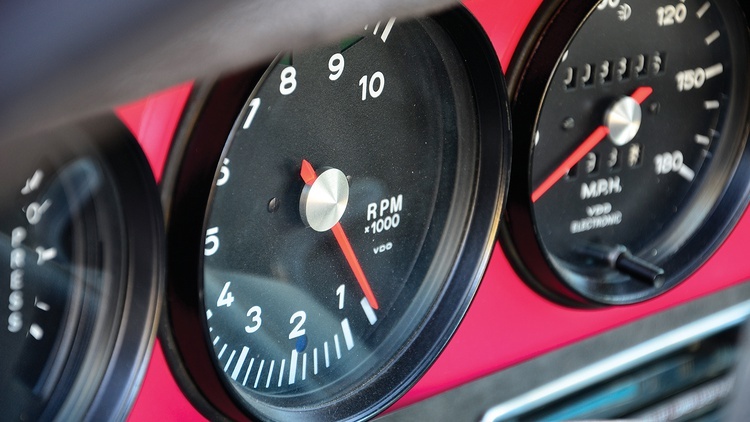 We go no higher than 7000 rpm, not wanting to discover the engine's mechanical limits. 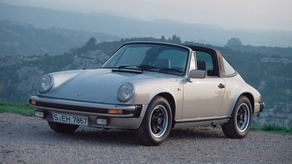 And where a carbureted 911 engine always has a couple of flat spots in the powerband, the electronic fuel injection ensures that the engine revs smoothly, without a hiccup—from idle to the top of the rev range. Thanks to the Wevo shift gate, shift action is completely transformed from relatively vague to precise and quick. Not only is the fore and aft shift throw shortened, but the side-to-side action is as well. The shift knob itself is a large, grippy Hurst shifter. Though it’s more commonly seen on Camaros, it’s right at home in this Porsche. 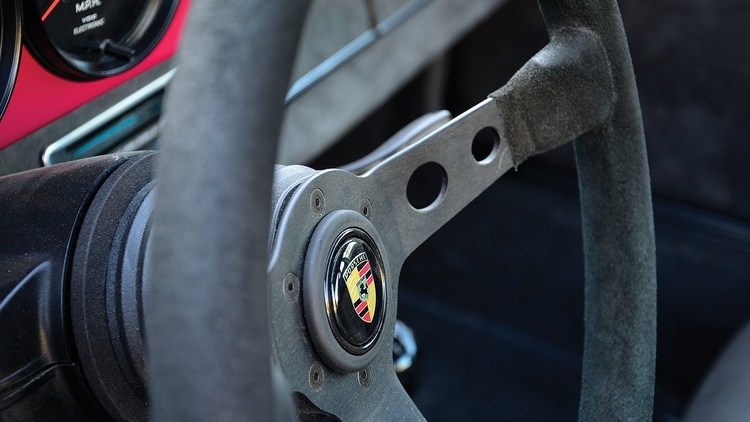 When it comes to suspension feel, the 911 has a firm ride and the tires feel completely keyed into the road. Mechanical grip is tremendous around corners, the suspension displaying no body roll. The stitch-welded and reinforced chassis feels very rigid, certainly more so than any early stock 911 we’ve driven. Overall, there is really nothing to complain about with this one-off creation. 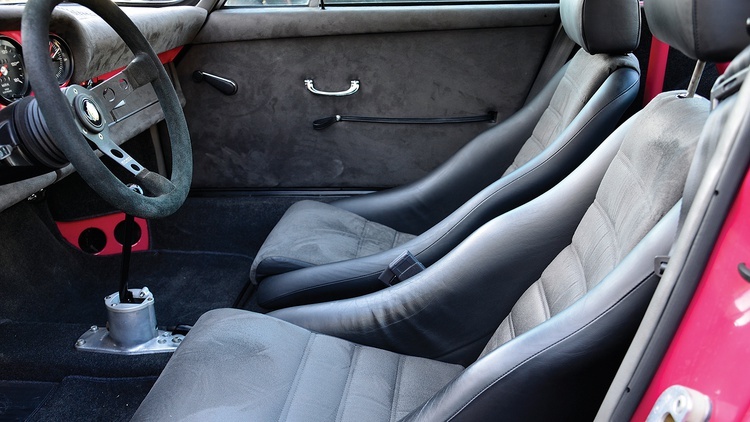 The interior is a great place to spend time, and the performance is on par with far more modern Porsches. The interior is decked out in suedelike Alcantara upholstery, while the suede Momo wheel mimics the drilled-out effect found on the door handles and the hinges of the trunk and hood. 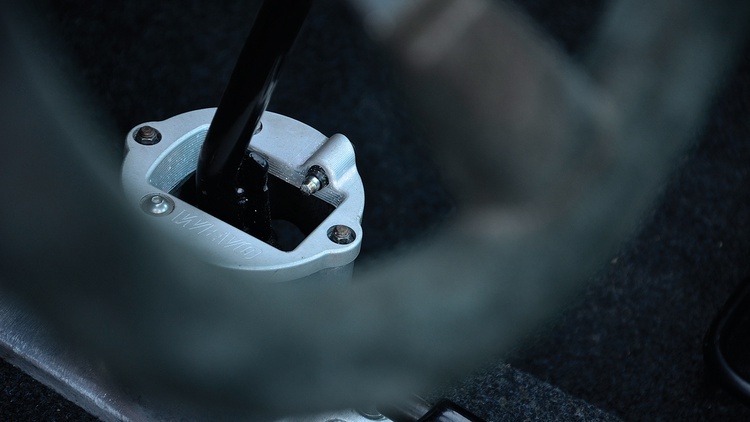 The Wevo shifter gate and Hurst knob shorten shifting while giving the cabin an industrial feel. Once Alex’s 911 was delivered to TRE, the Porsche was stripped down to a bare tub and media blasted. Any rusted metal was cut out and replaced. This included the front suspension pan, rear parcel shelf and various areas at the back of the car. Since Alex wanted power brakes, the entire trunk area from a 1985 Carrera was welded in, which included the brackets for the power brake booster. TRE also extensively stitch-welded the bare tub and then reinforced it in key areas, including the shock mounting areas, foot wells, skid area under the car, inner rockers and mounting points for the roll bar. The chassis is now stiff enough that Bouzaglou thinks the car boast the torsional rigidity of a 996-generation GT3. 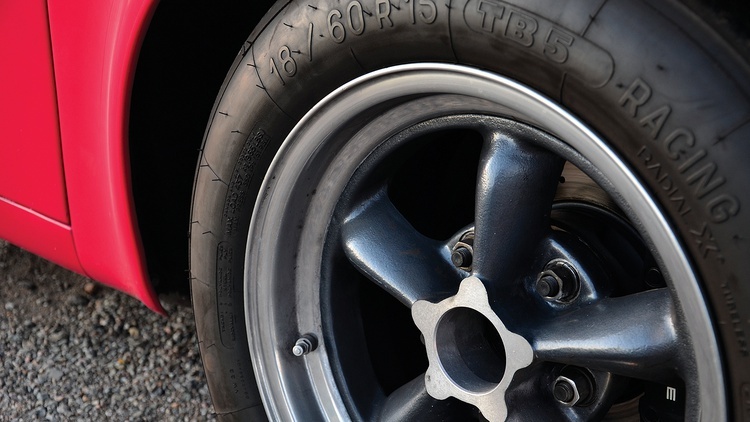 When it came to widening the bodywork with ST-style flares, the shop enlisted a metalworker to painstakingly hand-form them the old-fashioned way—by using an English wheel. “I dislike the visible transitions between glass and metal that can occur when paint ages, so we kept everything metal except the bumpers,” notes Alex. The fuel filler door was removed from the left-front fender and filled in. The tank is now filled through a door located in the center of the front hood. The battery boxes were also removed, and the battery was relocated to the smuggler’s box in the front trunk area. TRE added an oil filler door to the right rear quarter panel, which hides the oil tank—a feature that was only seen on the 1972 Porsche 911. 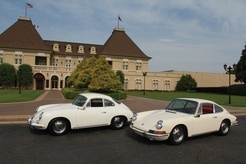 Axiom Motorsports sprayed the 911 in the distinctive shade of Fraise favored by Alex’s daughter. Rounding out the exterior changes are fiberglass front and rear bumpers, H4 headlights, European lenses and a chrome Talbot mirror. Alex notes. “Plus, I really like the look—it’s functional and attractive.” Custom mesh grilles, inspired by the original STs are used on the front bumper and rear deck lid. The door handles, hood hinges and trunk hinges feature drilled detailing. The look may be retro, but the powerplant is a little more modern. Under that spoiler-free rear deck lid is a TRE-conceived and -built 3.4-liter engine that began life as a normal 3.2-liter flat six. The shop lifted it from a wrecked 1985 Porsche 911 Carrera race car. 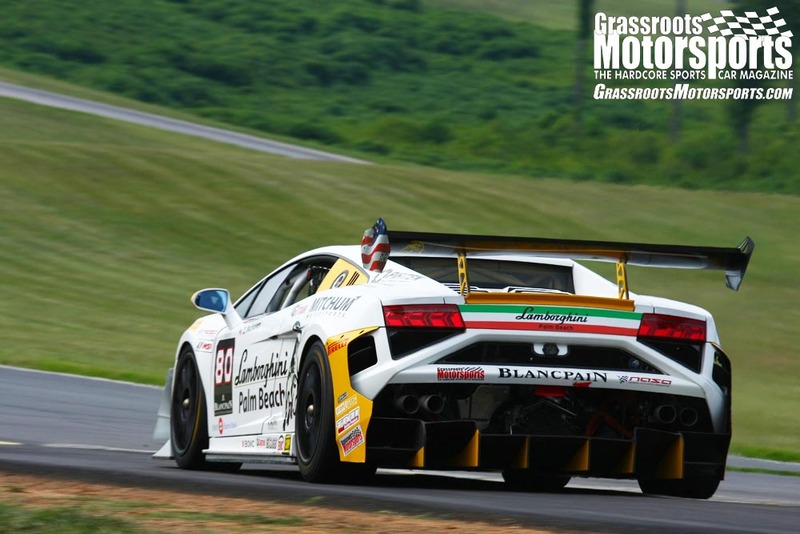 The engine was rebuilt with 3.4-liter Mahle pistons and cylinders, and it features a 10.5:1 compression ratio. 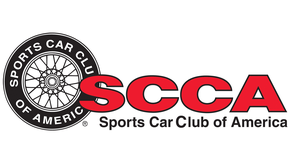 The camshafts are 911S-spec DC40s that were reground to work with the fuel injection. 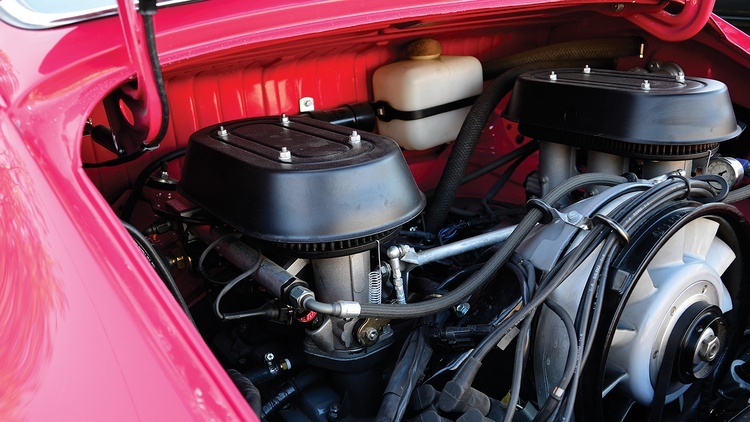 Two oil coolers ensure that the engine doesn’t overheat under pressure—one in each front fender. A GT3 oil pump keeps the oil circulating. The exhaust consists of 993 heat exchangers so cabin heat is retained. This leads into a custom exhaust fabricated by TRE. Since Alex was planning on actually driving the 911 regularly, he and the shop decided that a modern, electronic fuel-injection setup would be the best solution. A pair of 46mm PMO individual throttle bodies deliver fuel and air to the engine. The fuel injection is controlled by a Haltech engine management system. Once the car was shipped home, the fuel injection was fine-tuned by Russ Kelso at Performance Motor Car Investments to compensate for New Mexico’s high altitude. 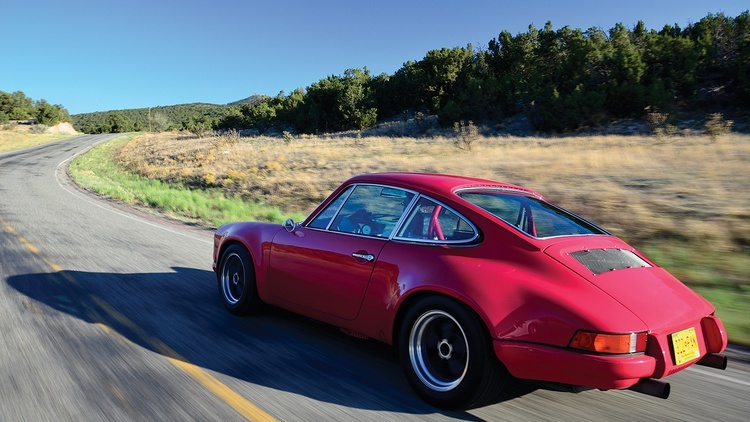 The new engine transmits power through a 915 gearbox—standard 911 fare from 1972 through 1986—that was rebuilt with shorter first through fourth gears and a taller fifth gear. A Wevo shift gate was installed in order to eliminate excess slop from gear changes, while a lightened flywheel frees up revs. In order to keep the 911 relatively streetable, mild torsion bars were installed: 19mm fronts and 26mm rears. 911 Turbo tie rods, another popular 911 upgrade, were installed, along with Bilstein sport shocks. 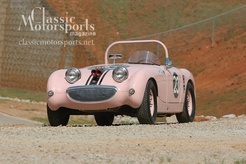 “The chassis is so stiff that the soft torsion bars and vintage high sidewall tires give some compliance,” Alex notes. Stopping is handled by Carrera front brakes and Boxster rears, all of which are driven by the power brake booster that now lives in the front trunk. It’s been said that wheels can make a car, and this early 911 is rolling proof. While the easy choice would have been a set of OEM Fuchs alloys or maybe some Minilite-style wheels, Alex decided to go with a set of American Racing Torq Thrust D wheels. The inspiration came from U.S. muscle cars and early competition 911s, Alex explains, although the Porsche fitment is very rare these days. “It’s a great look with the color, where Fuchs wouldn’t really have worked,” Alex says. The wheels were were custom-made by PS Engineering, Inc., specifically to fit under the ST flares. They feature American Racing centers mated to outer rims for a custom width and offset: 15x8 inches in front and 15x9.5 inches in back. The tires are equally different: The Michelin TB 5 is a period-correct performance tire that’s still available thanks to Coker Tire’s wayback machine. That car makes my heart ache remembering all the opportunities I've had over the years to have The 911. Beautifully turned out, nearly every detail I could see was perfect. I love blacked out horn grilles on a longhood 911. That filler cap is inconvenient for nice paint, though. You know, I always said that if I ever had a 1000+hp car, I'd paint it bright pink. 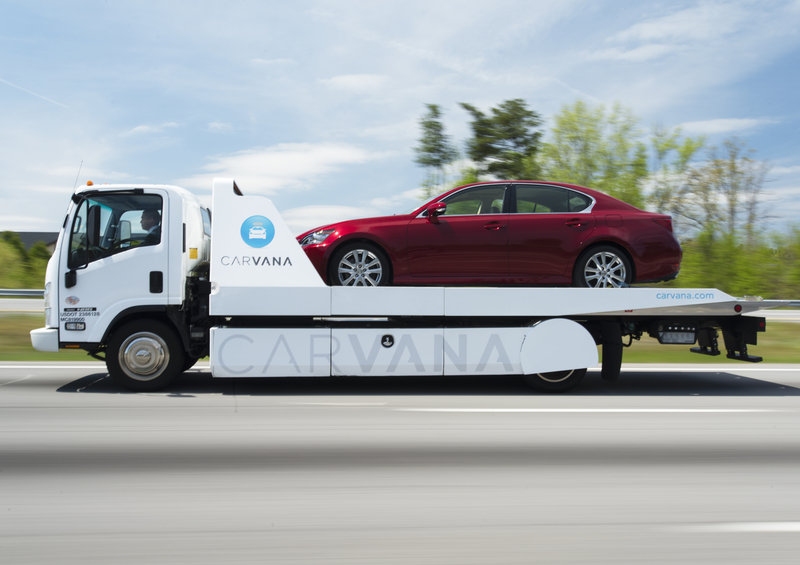 That was a joke, years ago when I was driving my Cavalier. photo done by Jamie Lipman. I always loved pictures that emphasized certain color spectrums like that. Well shot / edited! yup. But still have to be careful to not drag gas station fuel hose across fenders. Well, it seems I've made a mess of my pantalones. why don't I have enough money for both?